In the interest of procrastinating further on awardage, I give you PART TWO* of the Minoan Bull Dance post (click here if you missed part one)! Image from Wikicommons, by SpinningSpark. 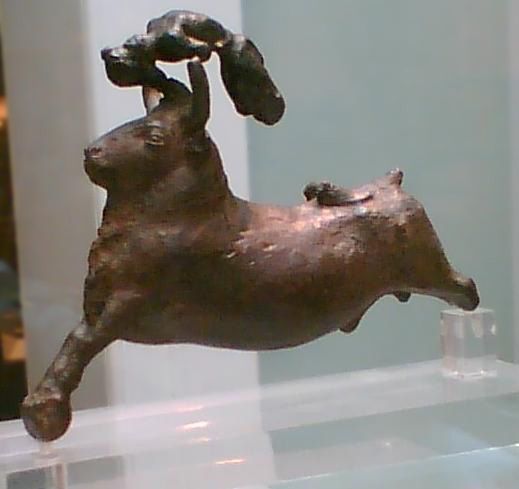 Minoan Bull Leaper bronze group. Well. First of all, Crete fell and the Minoan civilization, such as it was, collapsed. (Perhaps because Theseus slayed a Minotaur?) The long and the short of it is, we have no real idea or evidence for what happened. Mycenae seems to have conquered them, and then not long after that we have the Dark Ages where we know absolutely nothing about what went on outside of the oral history of Homer's epics. Except the bull dance isn't really dead. Cow-Leaping (aka Course Landaise) is still practiced in modern day France, and Bull-Leaping (aka Recortes) takes place in parts of Spain (seriously, there's pole vaulting involved! and the bull totally survives to be leapt another day!). Wikipedia even suggests that there's a practice of bull leaping in India as well--though I highly doubt it descends at all from the Minoans. There are a few clips of bull-leaping in France online. That link will take you to some really crazy guys who tie their legs together before jumping. I'm not kidding. I wish I were. But this is maybe my favorite youtube video-- it's about 5 minutes long, but has some great information. So there you have it! The modern Bull Dance! With all due respect shown to the bulls involved! I'd totally take our daughters to see this. It is definitely on my list of things to see while in that area of the world-- when I make it to Europe, anyway. I am amazed! And really thrilled to know that there is still a tradition of bull leaping out there. Mary Renault's books on Theseus feature the bull ring and bull dancing in ancient Crete, so I got a little bit curious :) Glad you're enjoying it! The narrator is correct; these recordadores (sp, I know) are spectactular. Now, I'm not a naturalist, or ecologist; I don't believe humans are bacteria on the earth, or even that we are the reason that the earth may be coming to the end of its ecological clock. But I don't believe in senseless killing either; and these professionals warm my heart. They take the same chances as the Matadore without the weapons. Bravo. On the other hand; I prefer my beef to have gotten some revenge on the slaughter house, and didn't stand in a stall getting fat so I could have a Mickey D's burger. There's just no right answer. I'm researching the Dananni for a fantasy novel I'd like to write. Frankly, the effort is daunting. I'm not sure I have it in me to write this novel, because there is so much involved in the world building. I've read your excerpts, and seen the research you've put into your novels, and I'm totally impressed. This video shows how dedicated you are to your chosen genre. How much you revere the culture. You do credit to the writing community. Thank you for sharing a piece of your passion. I am enlightened, and entertained. Thanks Donna! I'm glad you liked this-- I really think that Bull Leapers are fantastic. And I love that we have this tradition still somewhere. I wonder if we'll see a resurgence of this sport and a fade in popularity of the bull Fight itself. I kind of hope so. It definitely seems like a more humane sport, and an incredible test of bravery as well. Thanks so much for all your kind words! I really don't see the research part as any kind of monkey on my back-- it's born of love. I love history and I love learning about these things, so it's only natural that I would love writing about it too :) I am sure that if it is a book that you love and a story you love telling, you'll be able to persevere in the research department! Well, I had no idea! Thanks for sharing this-- I thought that vaulting was as close as it got. Love, love, love this, Amelia! Fascinating. I saw that you posted part two this morning and couldn't wait to check it out. It was well worth the wait! I had the Course Landaise described to me once, I think. The guy's English wasn't good and my French is non-existant but he kept making jumping movements and mooing (srsly!). It looks like in the french version there are actually caps over the horns? And the video from Toledo is awesome. I've always loved the Goya etchings but never thought to wonder why the bullfighters was pole vaulting. Haha! that's awesome, VR! I am trying to imagine this guy describing it and it is hilarious in my head. I'm not sure that they put caps on the horns, but I know in France the bulls are guided on ropes, rather than just a free for all rampage. The Spanish Bull Leaping is definitely a bit riskier. This is the craziest thing and I love it. The best part was when they all knelt to salute the bull at the end. I know! It would only have been awesomer if they did the Cretan Salute instead of fist to forehead. You are the QUEEN of Research! Have you read Stephen Lawhead's Pendragon Cycle? The first one has some bull-dancing/leaping in it if I remember correctly...probably based on similar research! I haven't, Tessa! But his name keeps coming up and I have the first book on my wishlist! I would totally go see bull-leaping in France! Bull-fighting in Spain? Not so much. Still. I would have to get SO drunk to feel as invincible as those ballsy Europeans prob'ly do. Well, the timing is right-- Theseus is the generation before Helen, and the Trojan War was basically the last "historical" event before the Dark Ages of Greece. I theorize that the Trojan War and the death of so many heroes was how the Greeks explained their fall from the Mycenaean empire and the incredible palaces (that must have been vacant ruins everywhere) to the state that they were left in during this period of time where there is no history, and everything kind of slid backwards into darkness. Hi! My sis follows you on twitter, and then I saw you commented on someone's blog that I followed, so I decided to come over and check it out. Omb! I Love Greeks, and Mycenaeans! :D This was so interesting! :) I will stalk *ahem* I mean, follow your blog now. I'm glad to have you, AchingHope! Thanks for coming over! Awesome conclusion to your Bull Leaping series. I hadn't thought about the fact that bull leaping probably died with the decline of the Minoan civilization... but that makes perfect sense. And it's good to see some cultures still practicing some form of it.